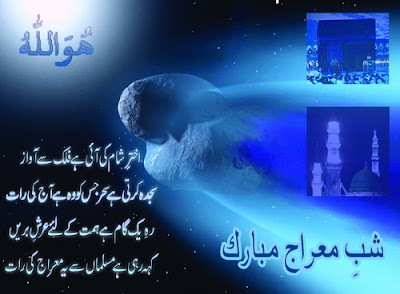 Shab-e-Mairaj wo shab k jis mein Nabi Eleh Sallato Wassalam ki Allah SWT se mulaqat hoi. Wo shab k jis mein Hazoor Elehe Salato Wasalam ko Maiaraj mili. Wo raat k jis mein Unhin pichli ummato ka hal dikhaya gaya, or apni Ummat k mustaqbil ki khaber di gai. Wo mubarak shab k jis mein ik tuhfa-e-Namaz inayat kiya gaya k Ummat-e-Muhammadi us raat ki kafiat kisi had tak is ibadat mein pa le k yeh to Wisl-e-Khaliq ka ik zareyia hi hey........ ! or phir agley din yanee k 27 rajab ka roza rakhey to Allah SWT us k tamam gunah maaf ferma detey hein or aftar k waqt wo jo b dua mangey ga us ki wo dua qubool ho gi. May Allah bless you from all Blessing. Please prayer for me as well. It is mentioned that we can pray the Nafl 12 rakats of Meraj night in 2,2 or 4,4 breaks. Whereas the breakup is not mentioned in the English translation. Why this difference? my dear brother,i have a request,could you please include more and more nafil prayers so that we get blessed by ALLAH S.W.T in this extremely blessed night. thanks so much ... now i m doing this , thanks for giving usefull information..
prophet Muhammad s.a.w.w. was physically transported to heaven. He is spiritually elevated. meraj ka matlab hi yehi hai k Allah nay app ko physically apnay pas bula k tmam makhlookaat main meraj di. SUBANALLAH ... ALLAH HU AKBAR... LAA ILLAHA ILLAA MOHAMMEDUR RUSUL ALLAH. It was a physical journey not spiritual one change it! Shab.e.Miraj k roza ki niyat kia hai sehar.o.Iftar? ?